Attachment theory has become a key focus of both research and practice in understanding and treating psychological and social risk for marital and relationship problems, parenting and clinical disorders. In particular, adult attachment style is a key explanatory factor for understanding problems in human relationships. This practical book introduces and explains an easily accessible assessment tool for adult attachment style, the Attachment Style Interview (ASI). Based on extensive research study, it discusses appropriate interventions and case assessments that can be made to help families in need. Simpler than the Adult Attachment Interview, which requires expert administration, the ASI is an invaluable and evidence-based resource. Presenting clear and concise descriptions of the measure and summaries of the attachment models developed, this text provides discussions of its relevance for different practice contexts, and uses a range of worked case studies to illustrate its principles and applications. It details attachment issues in different relationship domains to cover areas of risk and resilience relevant for practice such as: Adult depression and anxiety and stress models Partner difficulties including domestic violence Childhood neglect and abuse as a source of attachment problems Parenting and intergenerational transmission of risk Interventions, service application and use in family therapy. 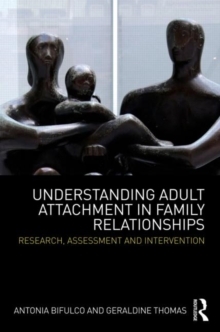 Understanding Adult Attachment in Family Relationships provides an important reference for all practitioners working with children, adolescents and families, especially those undertaking further study.